Woohoo! Starting another scrap project, parts of which were made last year, and now they are becoming blocks. It feels really good to move this out of the UFO bin! One circle down, three more to go. 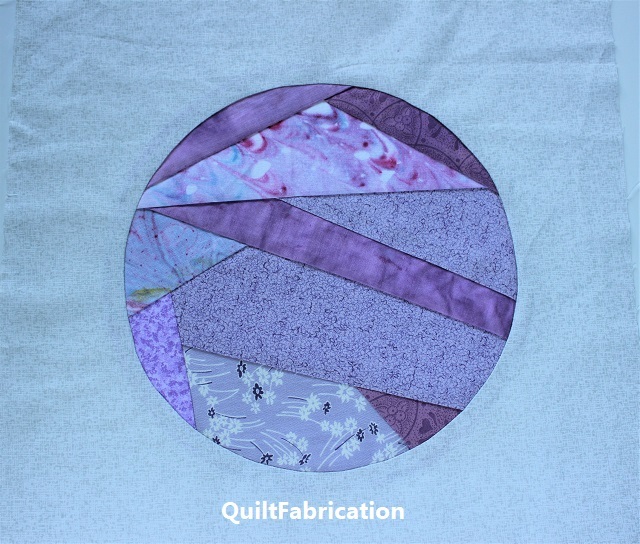 Want to learn how to stitch these circles into a block, with no applique involved? It's easier than you think! 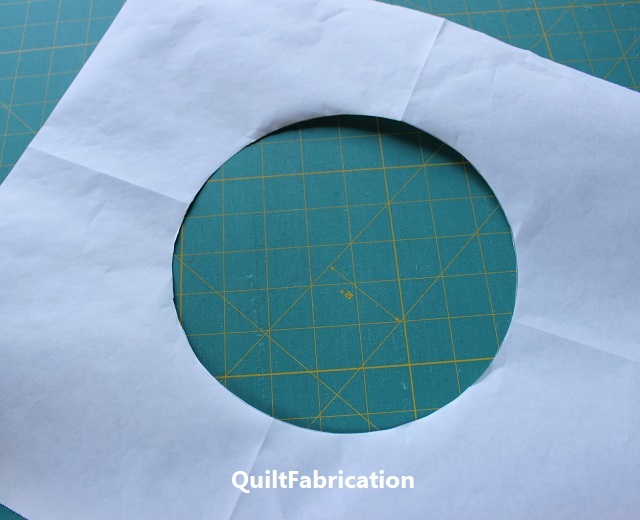 First, cut both an over-sized background square for the block, and a same sized piece of freezer paper. I choose to have a 12 1/2" finished block, so I cut a 13" background square, allowing for trimming later. 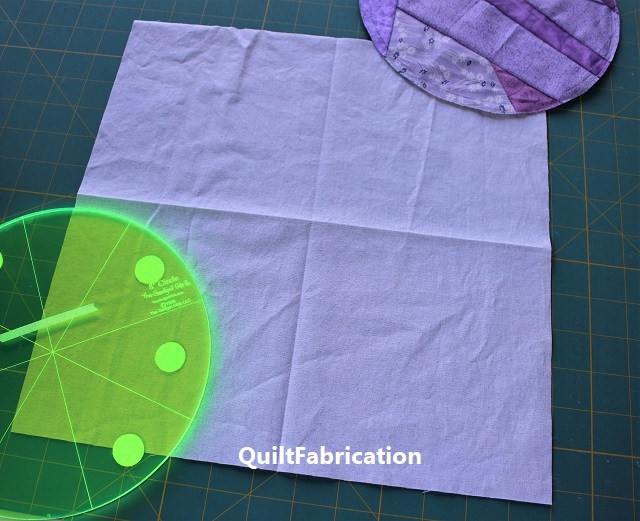 Fold it in half on each side, pressing to mark the center of the block. 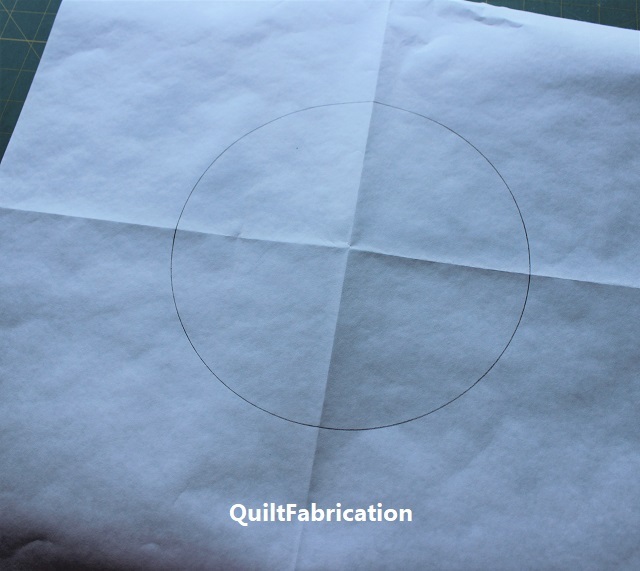 Since my unfinished circle is cut at 8 1/2" (finished will be 8"), I'll use an 8" circle template to mark on a same size piece of freezer paper. 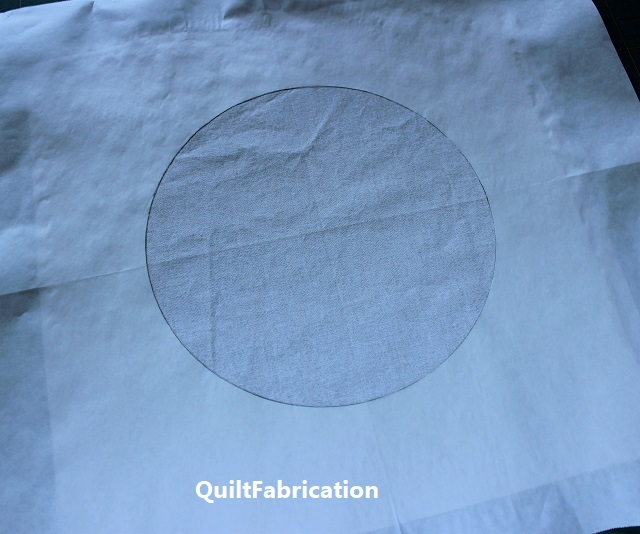 The freezer paper has also been folded on each side to mark the center. the freezer paper is ironed to the wrong side of the background, lining up the centering marks. 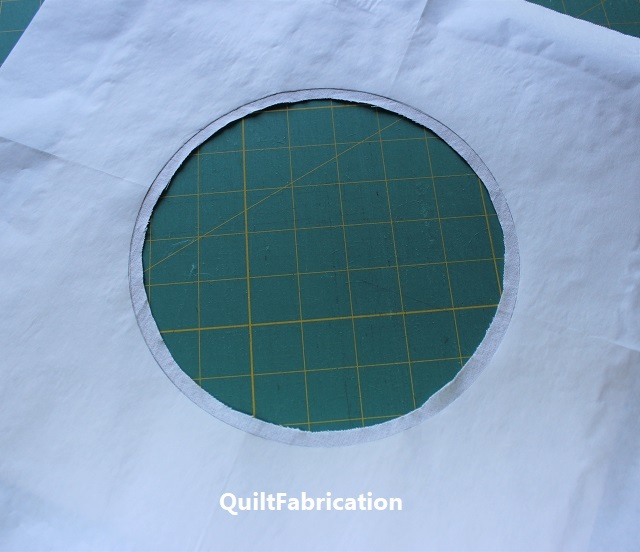 Trim out the center circle leaving a 1/4" seam allowance. 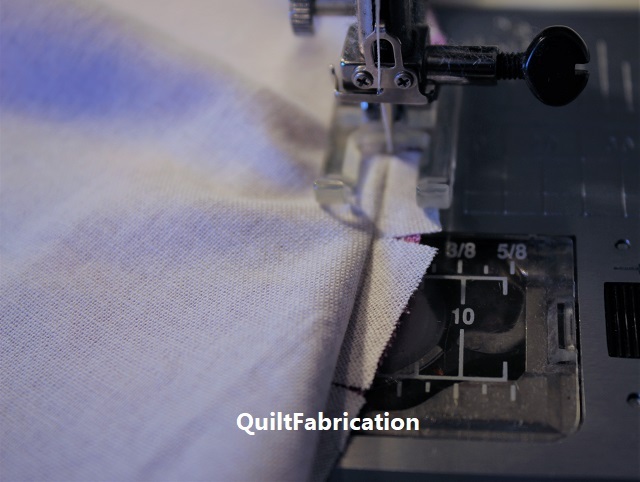 Clip the seam about every 3/4", then with a bit of starch, press the seam over the freezer paper edge. 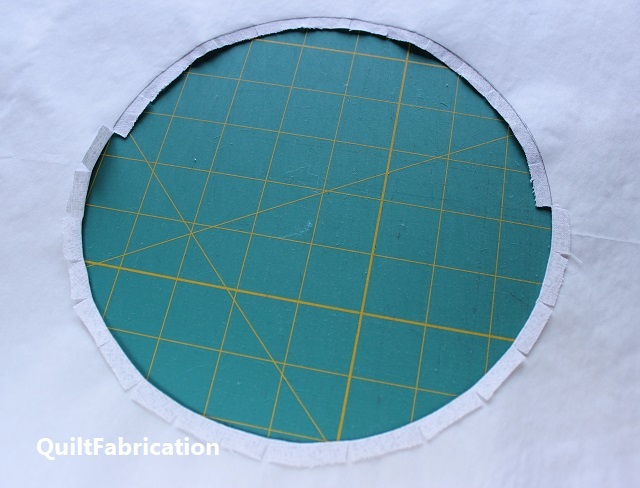 then apply the circle with right sides to the glue. Press. Now for the stitching. 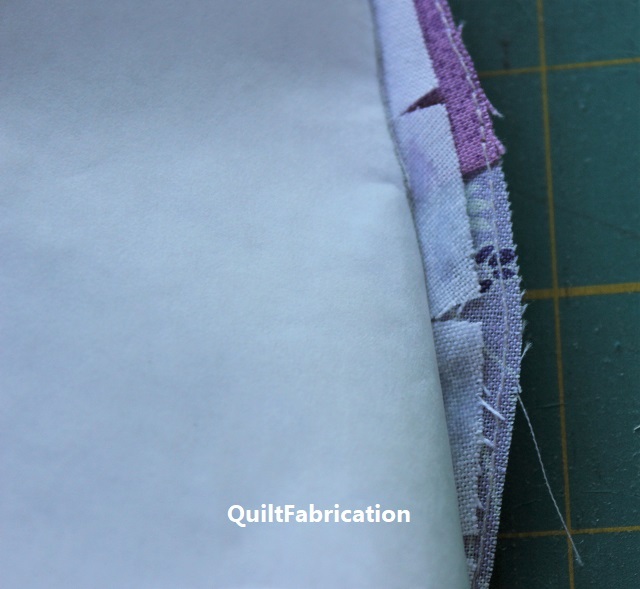 Carefully remove the freezer paper, making sure the glue bond in the seam allowance is secure. 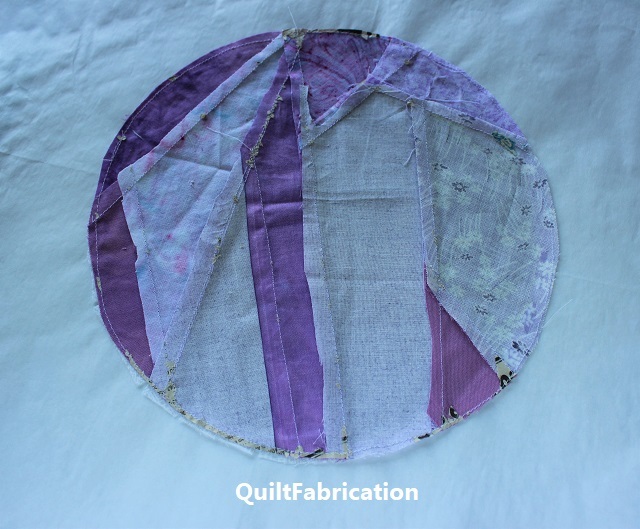 The stitching is going to take place in the seam fold of the background fabric, with the background on top and circle on the bottom. Here's a closer look at that seam fold at the machine. 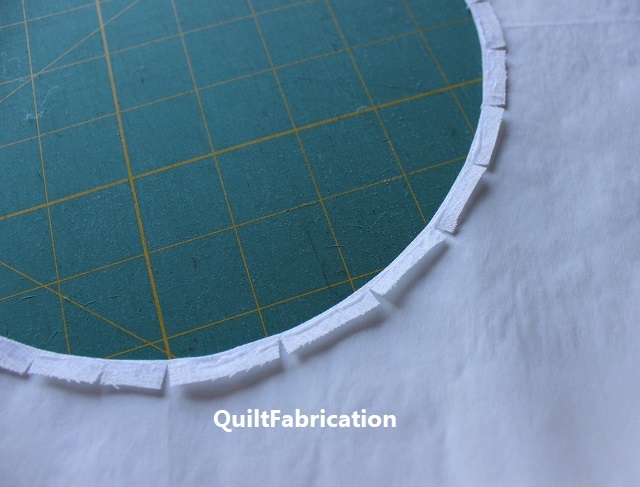 I recommend shortening the stitch length a bit, and slowly and carefully stitch in the fold. 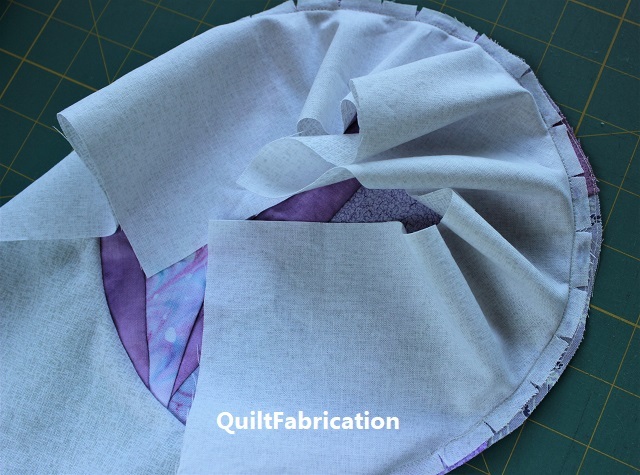 When done, the seam can either be pressed to the inside, or left to lay toward the background. Either way, give that block a good press, and admire your work! Great tutorial, I've got to try this! Wow! Cool and clean look. Thanks for the tutorial. Fantastic description of the process! This is a very thorough and well written/picture tutorial. Thank you. Wow, that is nice, Susan! I'll have to give this a go sometime!! Thanks for the tutorial! Hi Susan, that's a very good reverse appliqué tutorial. I've done it a couple of times but maybe I'm due for more! Thanks so much for linking up to TGIFF! Great tutorial, Susan. It is going to be so pretty. Wow, thanks for the tutorial.The blocks is fantastic!! This is a great tutorial and your block looks great as well. I wondered how that was done. Thanks for sharing. Doesn't seem too difficult to do. It is a good feeling to be able to move a UFO along. Pretty circle.